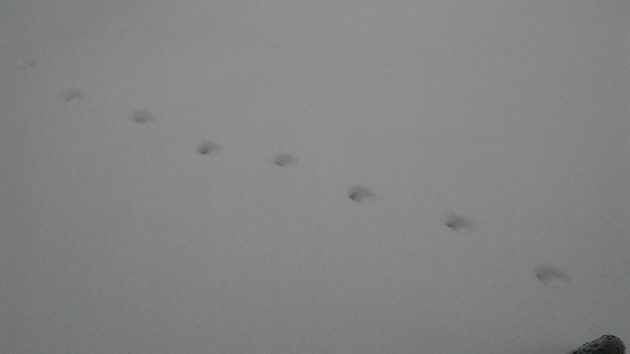 Hard to tell if this was one deer going and returning, or two going the same direction. Winter weather should make us think of the wildlife around the places where we live. 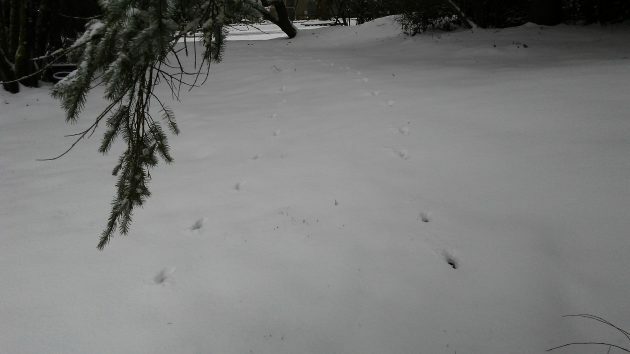 And if not, the occasional tracks left in the snow remind us that people are not the only ones suffering in the cold. Wild animals have been surviving Oregon winters for eons. But I think we have made it harder for many species other than our own by cutting down woodlands and brush and putting houses, landscaping, and streets on so much of the land outside the cities. Not much we can do about it now, I guess. But if you have a yard that you share with various animals, you might consider putting out some stuff that will sustain them during the rougher parts of the year. Ideally, big yards would have been planted with the kinds of bushes and grasses that provide shelter and nourishment for the wild animals that normally live there — or would live there if we hadn’t wiped out their habitat. This one’s a neighborhood cat, but it gets fed at home. Two sweet chipmunks have taken up residence somewhere on our N. Albany property. We’re feeding them raw (and unsalted) nuts but I don’t think they really need them since mostly they just fill their cheeks, then run away to bury them. Such a small act of kindness can bring such entertainment and joy. If you check the statutes I think you will find that it is against the law to feed Deer, Elk, etc. In National Parks there are many postings advising DO NOT FEED ANIMALS this includes, birds, squirrels, chipmunks, etc. I still feel sorry for the birds when most of their food source is covered with snow. Unlike their human counterparts, our wild friends don’t moan and complain and blame others for their plight. They do the best they can with what they’ve got. We have much to learn from the creatures surrounding us. Hasso, in reading the reactionary comments on your humane choice to feed God’s little creatures, it is disturbing to see the brutally cold recommendations of your readership. One wonders how long they’d last living on the land, shunned by their fellow creatures. It is no wonder Linn County has been named the epicenter of Ayn Rand Land. Maybe our new fearless leader will invest locally. Doubtful. You are speaking of our Pres.-elect? He holds a grudge. In addition to being a narcissist If he can’t make a stack of bucks or have his ego stroked, in just the right way, he isn’t going to care. Or worse. Prepare! ….we’re in for one helluva carnival ride.